The tournament will be running this weekend. We aim to create a pleasant environment for playing chess. Below are the answers we received at last year's tournaments to the question of what do we do better than other tournaments. Clocks now provided to top 4 sections, Championship - U1800. 30" increment time control in the top five sections → No more clock smashing scrambles at the end of the game. Score-based prizes → See the advantages below. Clocks provided in the Championship through Under 1800 sections → All you need to do is show up. Minimum 2000 rating to play in the Championship section → Less mismatch games. 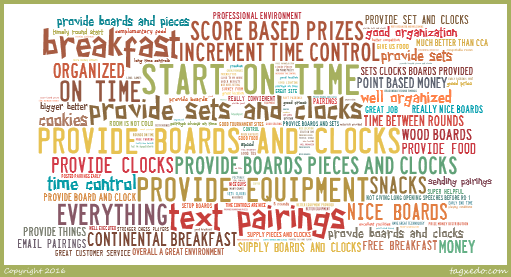 Sets and board provided for everyone→ No more carrying around pieces and a board, just bring a clock. Free Monday morning Continental breakfast → Relax, have some coffee and a danish before you start your game. Free Day guest parking → Don't worry about where you have to park your car. Hotel next to DC Metro stop→ Take the Metro directly to the tournament. 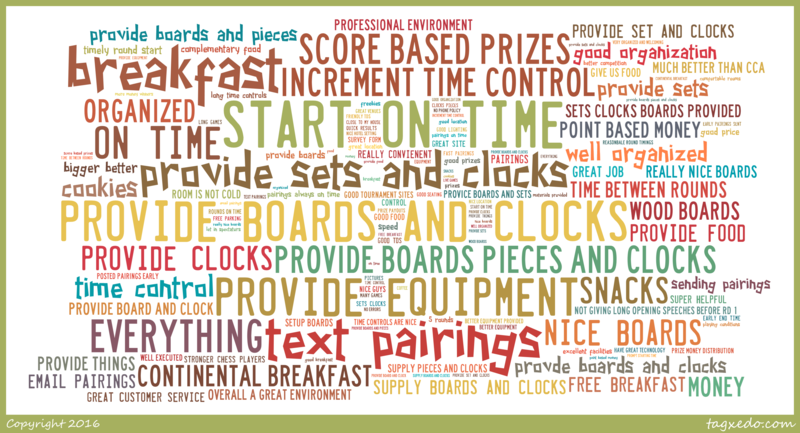 Shorter time controls in lower sections → Less waiting around between rounds. This tournament will pay prizes based solely on your final score. All the prizes are guaranteed. If the total pay out in the Open section is less than $1500, extra money will be added to the pay out of the top score group to bring the total to $1500. Your score determines your prize. Once you finish your last game, you can receive a check. Your prize does not get lowered if others tie with you. For example, if there are two 7-0 players, both receive the full amount for 7-0. The total payout is always higher when games are decisive. Unrated may enter any section, but may not win over $100 in U1000, $200 U1300, $400 U1600. Balance goes to player(s) with same score or is divided among players in next lower score group. At-the-door (cash or credit card) $130. We'll be using Square to process credit cards. Cancelations will receive a 100% refund if we are notified at least 2 hours before start of the 1st round. Under 1300 section: all entrance fees $35 less. Under 1000: all entrance fees $60 less. Free early entrance to GMs. $50 will be subtracted from any prizes. $45 discount EF for IMs. $20 will be subtracted from any prizes. $5 discount if staying at hotel. Champ - U1600 4-day schedule: Reg ends Fri 7 pm, rds Fri 8 pm, Saturday 11am and 6, Sunday 11am and 6, Monday 9:30am and 3:30. Champ - U1600 3-day schedule: Reg ends Sat 10 am, rds. Saturday 11am, 2:15 and 6, Sunday 11am and 6, Monday 9:30am and 3:30. U1300 4-day schedule: Reg ends Fri 7 pm, rds Friday 8 pm, Saturday 11 and 4:00, Sunday 11 and 4:00, Monday 9:30am and 1:30pm. U1300 and U1000 3-day schedule: Reg ends Sat 10 am, rds. Saturday 11, 1:15 and 4:00, Sunday 11am and 4pm, Monday 9:30am and 1:30pm. U1000 2-day schedule: Reg ends Sun 10am, Sunday 11, 12:15, 1:30, 2:45, and 4:00, Monday 9:30am and 1:30pm. Reentries: all, $90 except U1000 and U1300 $50. You can reenter any schedule taking 1/2 point byes for unplayed games. If you reenter with a single 1/2 point bye, the cost is $80/$45. If you reenter with two 1/2 point byes, the cost is $70/$40. Hotel Rates: $99 per night! $5 EF discount if staying at hotel. So make your reservations early. Phone 301-468-1100. Parking is free for day guests and $10/night for overnight guests.